Republicans seem to have a really, really narrow idea of what constitutes racism -- which is how they're able to claim that the Tea Parties aren't riddled with racism throughout. The Weekly has obtained a copy of an email sent to fellow conservatives this week by Marilyn Davenport, a Southern California Tea Party activist and member of the central committee of the Orange County Republican Party. 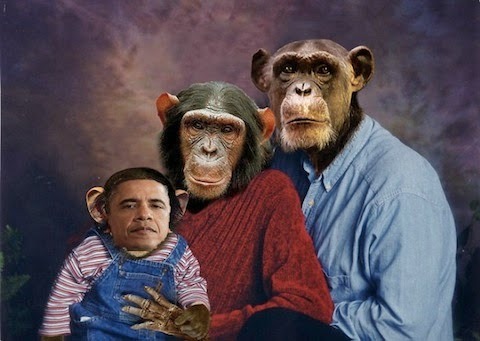 Under the words, "Now you know why no birth certificate," there's an Obama family portrait showing them as apes. As always, the "sweet little old lady" who sent the mail had no idea that anyone might possibly construe the mail as racist, even though comparing black people to various kinds of apes has always been a stock feature of racist denigration in America. Why, some of her best friends are black! The image did upset several local Republicans. "It's unbelievable," one high-ranking OC GOP official told me. "It's much more racist than the watermelon email. I can't believe it was sent out. I'm not an Obama fan but how stupid do you have to be to do this?" Another GOP official, who also asked not to be identified, said that Davenport is "a really, really sweet old lady so I am surprised to hear about this." Scott Baugh, chairman of the OC Republican Party, told Davenport that the email was tasteless, Davenport--a Fullerton-based political activist--admitted to me during the telephone interview. "You're not going to make a big deal about this are you?" she asked me. "It's just an Internet joke." But Baugh believes the email is a big deal. "When I saw that email today I thought it was despicable," Baugh said. "It is dripping with racism and it does not promote the type of message Orange County Republicans want to deliver to the public. I think she should consider stepping down as an elected official." And just remember: There's nothing, NOTHING racist about those Tea Partiers, either. Just another isolated incident. Move along, please.